Now under the wing of Scientific Gaming like Barcrest and WMS, Bally games are appearing in more an more online casinos, for example their Titanic Slot. Their most well known games began as land-based slots in North America and are available online now, i.e. the Quick Hit Platinum series. 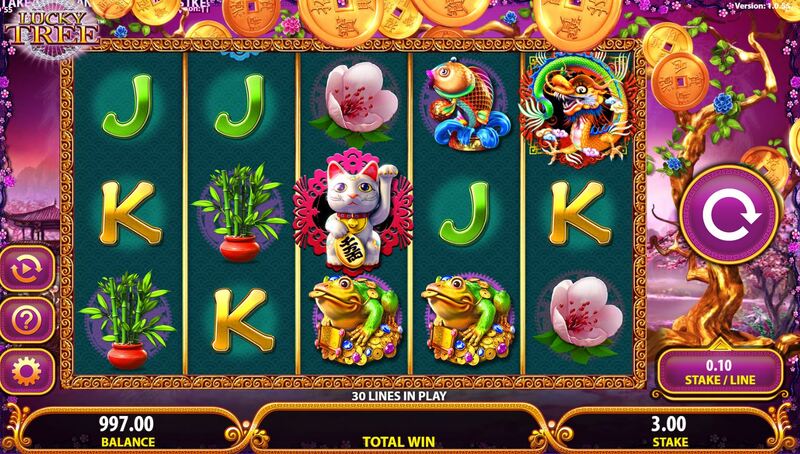 Here we have Lucky Trees, an Oriental-themed slot with 5 reels and 3 rows offering 30 pay lines. There are various Wilds on all 5 reels including lucky tokens, and dragons. Sometimes this makes it hard to spot a winning spin as unless you remember the various Wilds you will think you have lost only to see a win counting up! 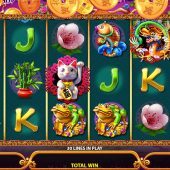 This brings us to the random in-play Wild feature which occurs quite frequently - the Lucky tree will shake after a spin and drop 2 to 7 Gold Token Wilds onto the reels to increase the chance of a win. The only problem is that if you use the autoplay it will stop it and you'll need to reset it - you'll never reach the maximum of 100 spins without getting this feature. We have 2 bonus features. Firstly 3 pink cats on reels 1, 3 and 5 award a pick-me round. Before you sigh with disappointment (yes! these are usually rubbish!) let me tell you that it's possible to hit 5000x stake in this! You choose from 3 pots and get picks ranging from 7 to 14. There are various coloured frog idols hiding behind 30 boxes and should get 8 of the highest-paying then that's exactly what you will reap! I had 11 picks and revealed 4 Jade Frogs and this paid 75x stake plus a smaller award for the 3 White Frogs to make over 80x. There are Ying and Yang scatters on reels 2, 3 and 4 and these trigger 10 free games which may be retriggered. During these free games you will get the Lucky Tree in-play feature as described above on every spin. So you are just as likely to get a big win on both bonus rounds which is always a plus for the player.